We have the entire summer to make the most of this wonderful fruit, our strawberries, so let’s start right away 😊. I am heading to my dad’s garden ready to fill a basket full of this little beauties! So versatile and fresh it can be enjoyed in a lot of different ways – whether it be a simple fruit salad, paired with whipped cream or turned into jam! I have chosen to use mine on top of some delicious vegan & gluten-free frangipane tartelettes! Strawberries should (ideally) be eaten between the month of May and August. Don’t be fooled by the big strawberries often display in supermarket, they are in fact full of water! The smaller, the tastier they are! 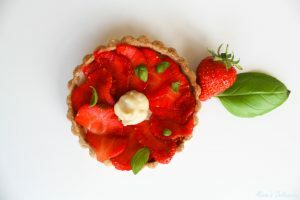 The sweet almond aroma of the frangipane combines perfectly with the freshness of the strawberries. 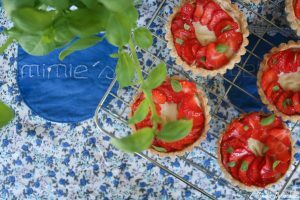 For a summer touch, I like to add some basil leaves on top of each tartelettes. 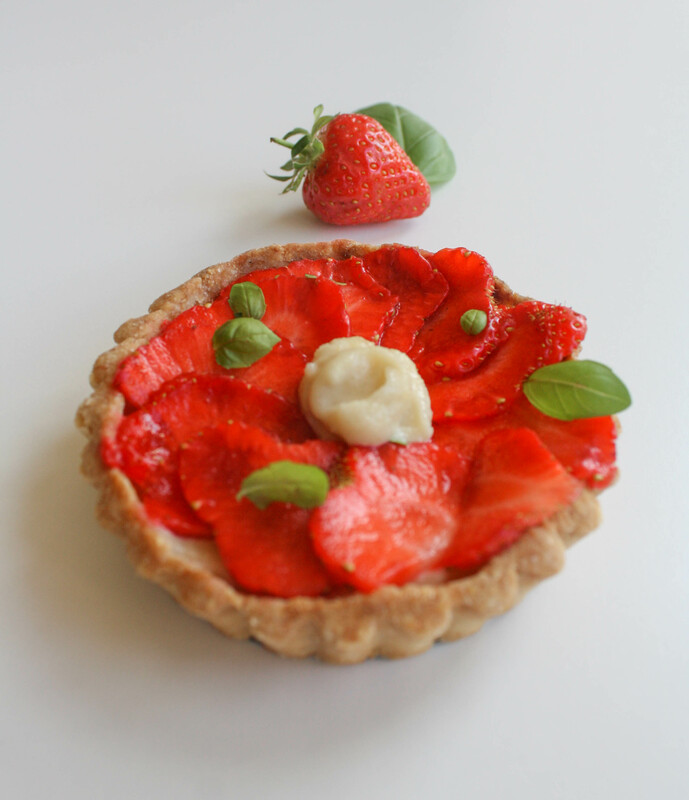 This will enhance the flavour of the strawberries, a match made in heaven! 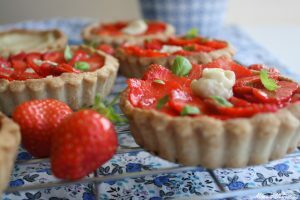 These tartelettes (little tarts in French) are so fresh, they are the perfect summer treat. And they will be ready in less than no time so that you can enjoy the sun shining outside! They are vegan, gluten-free and contain very little sugar, so you don’t have any excuse not to have a 2nd serving of it 😊. I hope you try and like this recipe, if so let me know! Share on Pinterest (click the picture) and tag a photo on Instagram #mimies_delicacies so that I can see your lovely creations as well as helping me reach more of you lovely people! Merci my friends! Each delicious mouthful tastes of summer! Place all the ingredients for the frangipane into a food processor and blend until smooth. Fill each one of your tartelettes base with the frangipane (I like to fill mine up to the top 😊). Hull the strawberries and slice them lengthways into thin slices. 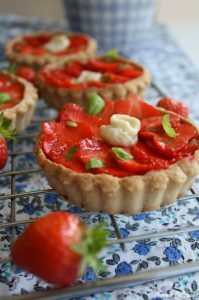 Arrange them in a spiral round the tartelettes (if desired) and scatter with some finely chopped basil leaves for a delicious summer touch!